Even when everything seems to crumble, there’s still a reason to be thankful. It’s a really difficult when mother nature takes the life of somebody you love. There is nobody to be angry with, to lock up or get justice from. When Hurricane Sandy hit New York city, it took away about 74 tragic fatalities in the tri-state area, homes and businesses were destroyed but like in the Dark Knight movie, out of the ashes shall emerge new life. Amidst the devastation in the storm, families welcomed babies into their lives — in spite of hospital evacuations, unnavigable roads, and darkness. One of the proud mothers is Julia Alemany, 34, from Brooklyn, New York whostarted experiencing contractions when the storm began. People started running through the hallways. “Suddenly, I hear a lot of commotion outside and the word ‘Fire!’” Alemany told reporters. Luckily, there was no fire, but Alemany’s road to delivery didn’t get easier. The hospital was being evacuated. Doctors gave Alemany an epidural before bringing her out, but the anesthesiologist had to administer it in the dark. 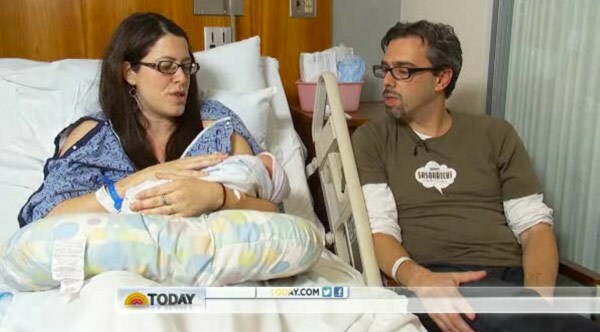 “I was holding a cell phone above her while they were putting in the IV and while they were putting in the epidural,” Alemany’s husband, Doron Markus said on TV. Once she was comfortable, Markus said, Alemany was placed on a sled-like stretcher and carried down eight flights of stairs to an ambulance. Their trip to Mount Sinai Hospital, 60 blocks north, was interrupted by a loud boom -– a tree had fallen on the ambulance. The vehicle proceeded and Alemany gave birth to baby Micah at at 12:48 a.m.
News reports that of 215 patients who were evacuated from NYU’s Langone Medical Center, ten were expectant moms and Alemany was one of only two who were in active labor while being transported. Alemany was not the only one expecting in the chao, in the NYU maternity ward was Sally Bertouch, 31, an Australian who has lived in New York for three years. She and her husband James Bertouch were staying at a hotel ten blocks from the hospital, having evacuated their Tribeca home before Sandy. Bertouch, pregnant with her first child, felt the first signs of labor at the hotel at 2:00 on Monday morning, and twelve hours later the couple decided it was time to get to the hospital, and somehow found a taxi in the “horizontal rain”, news.com.au reports. About six hours after they arrived, the power went out. “There were no monitors, no foetal [sic] monitors, all the doctors had glow sticks around their necks. I had a flashlight. Sal was lying in the bed in the dark and the wind,” the new dad told the Australian newspaper. Then, like they did for Alemany, anesthesiologists administered Bertouch’s epidural by flashlight. At midnight -– in the middle of her labour -– Bertouch also evacuated.. She arrived at Mt. Sinai hospital at 1:00 am on Tuesday and delivered baby Sophie Deborah at 10:27 that morning. “She really is beautiful. She is super relaxed and she has no idea of all the drama that surrounded her birth.